I was born in Chicago and grew up in Oak Brook, IL. After graduating high school, I was accepted into an accelerated 7-year dual-degree Pre-Dental Science program. I attended Lehigh University in Bethlehem, PA for undergraduate studies and the University of Pennsylvania in Philadelphia, PA for dental school. After receiving my DMD degree, I completed a general practice residency and pediatric dentistry residency at Bronx Lebanon Hospital Center in the Bronx, NY. I served as chief resident during my pediatric residency. Additionally, I am board-certified and an American Board of Pediatric Dentistry Diplomate. After practicing in Atlanta, GA for over 5 years, I moved back to Chicago. 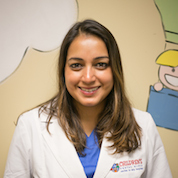 I am very excited to be a part of Children’s Dental World! I enjoy yoga, traveling, and spending time with family and friends. My memberships include The American Board of Pediatric Dentistry (Diplomate), American Academy of Pediatric Dentistry, Illinois State Dental Society, and American Dental Association.